✽ In the food processor, add olive oil, orange zest, garlic, tarragon, parsley, herbes de Provence, 1 tablespoon orange juice, marmalade and 10 olives. Process for 60 seconds until it makes a paste. ✽ Slip your fingers under the skin of the breast meat of the chicken and generously slather some of the mixture inside. Settle the chicken on the roasting rack in the roasting pan, and then slather the entire exterior of the bird with the paste, allowing any extra to slide off to the bottom of the roasting pan. Stuff the cavity with the leftover rinds of the orange. Add the rest of the orange juice, chicken stock and remaining olives to the bottom of the roasting pan. 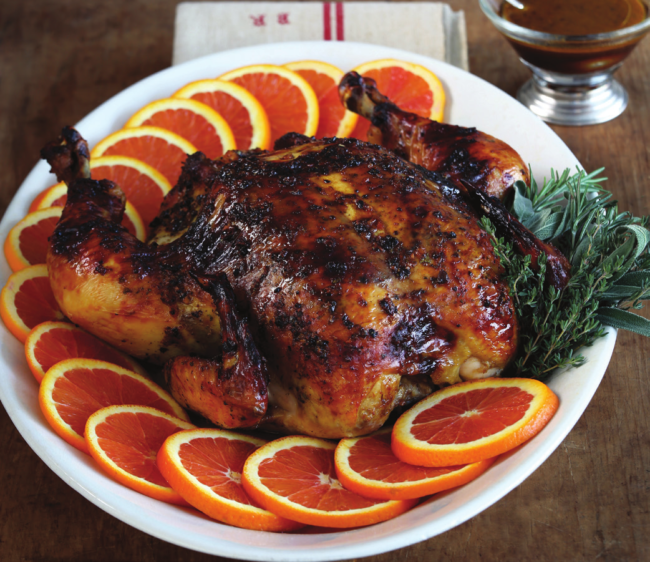 ✽ Transfer the chicken to a serving platter to rest while you place the roasting pan on the stove over low heat. Add a little water to the pan, and with a wooden spoon, scrape off the bits from the bottom of the pan and stir until you make gravy. Serve with the chicken. ✽ Instead of water, add wine to the bottom of the pan when making the gravy.